When I was at home for Thanksgiving break, my brother and I braved the freezing wind to walk to the movie theater to see Argo. I’d heard a film buff friend of mine rave about it, and the electrifying trailer set to Aerosmith’s “Dream On” got my brother interested enough that he agreed to be dragged along. I had high expectations, and indeed, the movie is compelling. 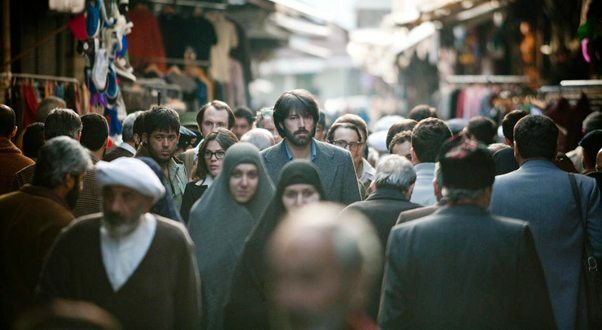 Chris Terrio’s tightly plotted, quip-studded screenplay tells the true, recently declassified story of a CIA agent (Tony Mendez, played by director Ben Affleck) who passed off six American diplomats as the crew of a fake sci-fi film called Argo to smuggle them out of Tehran during the Hostage Crisis. The film nails the cool and the occasional awkwardness of late 70s fashion; it also uses some of the best music of the period to memorable effect, including Led Zeppelin’s foreboding “When the Levee Breaks.” The cinematography strikes a delicate balance between hazy Instagram-like nostalgia and handheld intensity. These aesthetic touches create an authentic atmosphere that might make you think you’re watching a movie in the vein of that classic 70s genre, the morally ambiguous political thriller—a thinking man’s thriller that explores several sides of a complicated situation and leaves the viewer certain only of the fact that he doesn’t know what to think. But the more I thought about this movie, the more I realized it simply gives an illusion of depth. A movie filmed with somewhat unconventional techniques, or featuring naturalistic dialogue and little plot, is automatically assumed to be “artsy” and thus philosophical, by association with the style of the French New Wave. Similarly Ben Affleck, said he drew on classics from the 70s like All the President’s Men for inspiration; and the pastiche of these films formulates a promise that we’re going to witness some well-informed reflection on how fucked-up politics are in the world, man. But Argo never delivers on this promise; it gets to have its cake and eat it too. Though the universe of the film is complex and interesting, content does not follow through on form. To clarify: Argo is set in a time when sincere hopes to change the world for the better had died with the 60s.The 70s produced movies that depicted reality not as it should be but as it was, in a gritty and increasingly explicit way, pushing the boundaries of what kind of content was permitted. Movies like The French Connection or The Day of the Jackal, and even indeed All the President’s Men, questioned ideas of what a hero was supposed to be, bringing to the screen violent, duplicitous men who skulked around in trench coats and used questionable means to achieve their ends. More “wholesome” protagonists and stories with a clear-cut morality were largely relegated to films set in alternate realities. The most perfect example of this is Star Wars: a struggle between good and evil that plays out in a fantastical world according to the mythic structure Joseph Campbell codified in The Hero’s Journey. The movie-within-the-movie, which I’ll refer to as “Argo”, is one such movie in which starkly differentiated “heroes” and “villains” face off in a fantasy world. But Argo, though it purports to paint the world with somewhat cynical realism, is just like “Argo.” Just as the setting of “Argo” is an Orientalist vision of an exotic pseudo-Middle Eastern fantasy world where anything can happen, Argo takes place in an Orientalist version of Tehran. This Tehran is so perilous and so alien that it might as well be a different planet: the locals are a de-individuated, inscrutable mass, in contrast with the differentiated main characters who are at a loss as to what to do in this society of seemingly irrational rules. For example, while the Americans are walking through the Grand Bazaar under the pretext of location scouting, one of them takes a picture of a shop. Cue the shop owner storming towards the photographer and yelling at her incomprehensibly in Persian, flying into an incoherent, screaming rage because she took a picture of his shop. Even when she gives the picture back, he does not calm down (implying he is irrational). The episode is overall frightening, unsettling, and it plays rather shamelessly on the worst fears of Westerners traveling to “exotic” countries: offending the locals, whom they imagine as superstitious and fixated on symbolic things (such as photography, which can signify possession of the object thus “captured”). And aside from the ways in which the audience is supposed to identify with the characters, the film presents a rosy moral paradigm where there are not just protagonists but heroes. These heroes are not as heroic as they seem. The CIA operatives are depicted as a group of ordinary American heroes, and the embassy employees as blameless white-bread Americans in mortal danger from the dark, savage, inscrutable Iranian Revolutionary Guard who in their anti-American rage have taken to killing people just for having Americans’ names in their Rolodex. Their escape is a clear victory for the forces of good. But the glory of this escapade becomes more dubious when you consider the historical context. Iranian-American relations were extremely tense and Iran was wracked by anti-American riots; what Affleck doesn’t really dwell upon is that there was a very substantial reason for this discontent. In the 1950s the CIA had toppled an Iranian Prime Minister for daring to nationalize Iran’s oil, which set the stage for Shah Mohammed Reza Pahlavi to enforce an authoritarian regime under the guise of Westernization and progressivism. When the Shah’s regime fell to the Islamic Revolution, the Iranian people wanted to hold the Shah accountable for his unjust governance, and when the US refused to extradite him, Iranians saw the US as denying them justice and basically deciding whether the Shah would answer for what he’d done when the choice was not America’s or the CIA’s to make. Hence the riots and the hostage taking and the danger the US diplomats were in. So this movie as about how the CIA meddled in Iran’s affairs because US citizens were in danger because Iranians resented the US for meddling in Iran’s affairs. The film opens by giving background on this historical context but then goes right on to portray the CIA as heroic for doing exactly what Iranians resented it for doing. These concerns—Orientalism and the moral paradigm—were quickly evident to me, or at least I knew right away how I felt about these aspects of the movie. The one thing that still eluded me days after was why the film was named Argo. Was it a modern adaptation of the myth of Jason and the Argonauts? Both go something like this.. The hero (Jason/Tony Mendez) must leave his homeland to seek a precious MacGuffin (the Golden Fleece/six US diplomats) guarded by a vigilant, evil entity (a dragon/the Revolutionary Guard). No one thinks he’ll succeed; the endeavor seems doomed. The hero asks an authority figure (Phineas/the Ministry of Culture and Guidance) for help (sailing directions/a film permit) to reach his goal. He and his companions (the Argonauts/the diplomats) must pass through a dangerous place (the Symplegades/the Grand Bazaar). These parallels aside, it is also worth noticing that the script deviates from historical events on occasion in order to fit this framework—possibly to give priority to the mythological allusion? So it’s possible that Argo is indeed inspired by the myth of Jason and the Argonauts, but the parallels may be there just because it happens that both follow Campbell’s schema of the Hero’s Journey. After all, by definition it describes most narratives, and movie scripts are deliberately crafted to fit this emotionally satisfying framework. In short, the parallels are inconclusive. But that doesn’t end up mattering because calling the movie Argo lends it an air of something that has a meaningful relationship to classical culture. The title is evocative of many things without really realizing anything, which makes it really a perfect title for this movie that is only deep on the surface. In short, Argo is a high-quality piece of filmmaking in that it tells proficiently and engrossingly the story it had set out to tell. However, the movie identifies itself with the genre of political thriller and by doing so it sets for itself a standard higher than just making the audience feel excited by the suspense and satisfied at the ending. It promises us that it will question who is right and wrong; that it will portray both sides in such a way that we can, if not support them, then understand their motivations; and that it will not simply give us heroes to adore and villains to revile, because in real life, there are no such clearly defined roles. And Argo fails this on all counts, and despite its impressive sense of style, what little substance the film has comes down to a dull, reactionary and even offensive message. It’s a good movie in the way a pulp novel is a “good read,” fun to consume, but not a “good book,” worth consuming. Will Argo win an Oscar for something? Probably. Roger Ebert loved it, if that is any guide. It probably has better acting, dialogue, and cinematography that many of its peers; it was made with more care, rehearsed longer by a better cast. As someone with (much smaller-scale) experience of making movies I thought that I would have been proud to produce one that looked so good and flowed so smoothly. But from an audience perspective I could find no way in which it truly resonated with me; though it functioned as a piece of cinematic product, my enjoyment of it was marred by its political conscience. In this way, Argo manages to be both good and bad. Nassau Weekly is automatically assumed to be “artsy” and thus philosophical, by association with the style of the French Emily Lever.